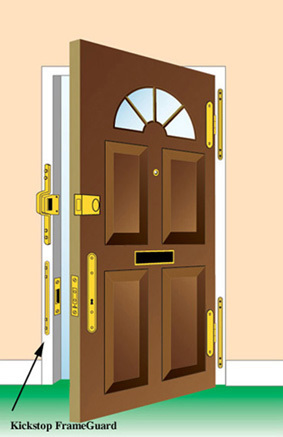 A Kickstop FrameGuard is used to reinforce and strengthen a wooden door frame around the striking plate of a mortice deadlock or sashlock. Fitting a mortice lock involves removing wood and this leaves a very weakened area around the frame. The Frame Reinforcer plates are bolted together through the door frame - to resist a 'kick-in' attack and forced entry and so help avoid a burglary. The FrameGuard is available in four sizes, five polyester powder coated architectural finishes and two polished and plated finishes. All Kickstop FrameGuards offer superior protection and resistance against kick-in attacks and forced entry. FrameGuards can also be fitted to strengthen the frame around the hinges. Fitting a FrameGuard around the hinge is relatively difficult to do without removing the door. A very much easier to fit option would be HingeGuard Plates or a Birmingham Bar. Supplied with security bolts and fitting instructions. An enlarged drawing to illustrate the fitting of a FrameGuard - click below.